« Check out the 2019 PAL® High School Conference Tees! 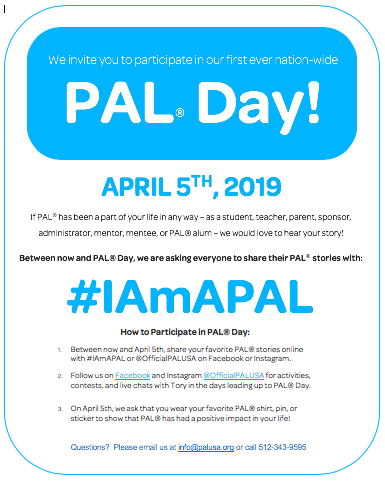 Our first ever nation-wide PAL® Day will be held on April 5th, 2019 to celebrate all the wonderful stories our PAL® students, teachers, sponsors, administrators, mentors, mentees, and alum have to share! Between now and April 5th, share your favorite PAL® story online with #IAmAPAL or @OfficialPALUSA. Follow us on Facebook and Instagram @OfficialPALUSA for activities, contests, and live chats with Tory in the days leading up to PAL® Day. On April 5th, no matter where you are, we ask that you wear your favorite PAL® shirt, pin, or sticker to show that PAL® has had a positive impact in your life!